Okay, so maybe you didn’t win the HGTV Dream Home 2016. If it makes you feel any better, neither did I! (This guy did.) They’re giving away another house now, though, and today’s the day they start taking entries. This is the HGTV Smart Home 2016 in Raleigh, North Carolina. Check it out! The main rooms are decorated with a mix of blues, greens, and grays. 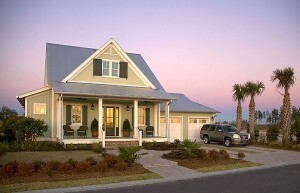 This HGTV Smart Home 2016 with a two-car garage was designed for a family to enjoy, with Southern traditional craftsman style, cottage details and a subtle color palette that creates a memorable welcome. It’s a blend of traditional style with contemporary touches. The kitchen features the patterned-tile trend we’re seeing everywhere these days. The designer says this tile was the inspiration for the rest of the decorating scheme on the first floor. The gold/brass trend also makes an appearance in the house. As some of these photos show, dark hardwoods are tough to keep clean! They tend to show everything. The living room seems small to me, but there’s a larger media room downstairs. I love that this house has three big porches! LOVE IT OR LIST IT Lawsuit: Couple Calls Renovations "Disastrous"
HGTV Dream Home 2010: Want It? I really didn’t care for: All of the art…without the art I would have liked the whole house better! All the new painted furniture (I like either truly painted furniture or real wood) which I always feel looks inauthentic, the plain, straight hanging drapes which look very mid-century modern to me, the can lights in the ceilings. Too much stuff and furniture, generally. In the category of What’s Up with That: Office/pantry combo?! Pantry, Yes! Office, Yes! Combo, No! Dining room for 6 in a family house: you can’t even have another family over for dinner. That makes no sense. Weird little living room. The only thing I like about it is the couch. If you don’t need a living room, don’t build one. Overall, I liked it more than most new construction. Some good ideas. Too much stuff. They do indeed have plans that are even interactive! You can click on a room and take a tour. There are also items to click in each photo that will tell you the paint color, the manufacturer, or where you can buy certain items. Here’s the link to the plans and the interactive tour. does it say what color gray paint they used? I didn’t notice if they mentioned it, but I’d definitely check! Round light fixtures/globes, retro geometrical accessories, and lots of plants, which also adds a bit of retro/seventies flair. Although the color scheme is different, I’m not sure I really care for it. I find it a bit dark and masculine. I love the kitchen tile, but I wonder how long patterned tile will be in style. Tile is not an easy thing to change up. I agree with Wendy: The office/pantry combination is a bit odd. Wouldn’t you feel as though you’d been stored away as well? Love the screened in porch with fireplace! I can see where a pantry/office combo would be helpful for the running of the house: meal-planning, grocery-list-making, bill-paying, scheduling, etc. Easier to keep an eye on the kids or dinner cooking! I think that is a good argument for a kitchen desk, but not one tucked away in the back of the mudroom! Out of all of them (past few years) this house is the least appealing to me. I do love blues and greens, but this house is just average, there was almost nothing that stood out for me, except for one: the kitchen tile. And if my home office was in the pantry, I would be eating, not working. The design is too busy, with too many elements that are going to be dated and ugly in 3 years. I HATE the kitchen tile and most of the curtains and the wallpaper and… I was excited when I saw this house was in NC but if I won I’d sell it and buy a different one. I agree. I don’t care for a lot of the decor. I don’t like the tile with the gray cabinets. I don’t like the wallpaper. Not crazy about those blinding accent colors either. But I like the house, love the porches so if I could pay the taxes on it if I won it i’d keep it, but I’d have to do some redecorating. What I like: the idea of three season outdoor living space with a fireplace and ceiling. My reservations, in addition to the floor plan issues: While the kitchen tile is beautiful as an object, it looks like something that will date the kitchen within a very few years. With the open floor plan, the tile also dictates color choices for far too many rooms. As currently decorated, it’s too dark and busy for my taste. Oh, well. I won’t enter this contest and hope the house goes to someone who really loves it. Looks like there may be extra space or attic space above the garage and on the other side of the second floor that isn’t decorated but shows on the floor plan to use for storage. Hate the guest room wallpaper, it would have to go along with that green sofa. But do like some things. Wasn’t there also a laundry room on the main level? I agree! I think the interior decorating is the worst I have ever seen from HGTV! It was so disappointing! The worst was the Asheville NC craftsman bungalow. I’m not that impressed by this house, but it doesn’t offend me the way the Asheville house did. I do hate that guest bedroom with the wallpaper. That would make my head hurt if I had to sleep in that bedroom. Maybe NC does something to the designers. oh gosh yes.. that was the adorable house that they butchered and removed all the charm. I love the colors in the kitchen and that wall tile. Yes, it will inevitably look dated eventually, but then I’ve always loved patterned tile and have seen it come and go in fashion. Some of my favorites are Victorian tiles, so, yes, patterned tile has been around forever (think Morocco, etc.). I would want some separation between the kitchen and the dining and foyer areas. I wouldn’t want someone coming in the front door and seeing the mess in the kitchen. The living area does seem small, even with a separate den on another floor. The guest room wallpaper is a bit much for me. I could take a rectangle of it framed, but not whole walls of it. I think there should be a laundry area on the main floor (pantry area or master closet?) – wouldn’t want to carry my clothes upstairs to wash them. The porches are great. I like the stair case trim and the front elevation is appealing. I’d take it! There is a main floor laundry next to the master closet. I had the honor to be chosen to tour The 2016 HGTV Smart Home on Media Day. It is truly beautiful and Tiffany Brooks did an amazing job along with the other most talented people who contributed to the success of the home. If you have a chance Julia, I have done 2 posts so far on the home; however, the first one will tell you how serendipitous this experience was! 1. Pretty, but overall rather dark looking. Not for me. I’d love to see the house decorated in lighter tints of the same colors. 3. Open concept kitchen/dining/living space. It all looks great and people think it’ll live well. But wait till the day when you’re trying to do a dinner party and something doesn’t go well in the kitchen! Your guests will see, hear and smell every little thing that flopped! LOL! I think unless you love to have your guests this much a part of your cooking, a kitchen with a little more privacy would be great! You know, I think the HGTV homes are ones where they’re trying to ‘showcase’ a lot of products from a lot of different companies and thus they sort of ‘overload’ the rooms with too much stuff, IMHO. If we could see less of all that, I think we’d all get a little better sense of the house itself, its floor plan and how we might live in it. Not a problem, about dinner guests. Because there is only seating for six at the table, so max two people over! But there is tons of seating just outside on the amazing screened in porch. It’s NC. You are going to want to be outside. Trust. I’m from Raleigh and the only thing that keeps you in is the mosquitoes and the blazing sun. With the screening, roof, ceiling fans and trees, all that is taken care of. I guess I’m different, but I loved it! So much better than the Dream Home and feels very “livable”. I have some of the same elements in my home (neutral walls, lots of blue, dark floors and contemporary art) so maybe that’s why I’m a fan!! Way too big. Cannot age in that house. They should build dream houses with one floor only. Overall, this house had a lot of “likes” for me — I use blue-green in my own home, so loved the colors on the first floor. However, I’m more subtle in my color/pattern choices, so I’m afraid ALL that tile in the kitchen would make me crazy after a while. It is very pretty, but just too much of it. I also prefer woodgrain cabinets over painted, although the gray was nice, if you’re caught up on the gray bandwagon. The same goes for the loud (oh, I know — it “pops”) wallpaper in the guest room; too much for my taste. I loved the porches — if I can’t be outside, let me be on a porch, especially one with a fireplace! And that amazing succulent wall feature on one of the porches — incredible! The gender neutral nursery was sweet — not a fan of the vibrant draperies, but I just prefer serene colors over screaming ones. The lighting throughout the home was interesting and I especially liked the staircase. I don’t typically work from home, so two offices wouldn’t be important to me, but for those who do work from home or spend a lot of free time at a desk/laptop, it could be convenient. I wish there was more seating in the dining room. The house appears comfortable for entertaining, but not enough seating for meals. Overall, I could see a family (mine!) living there. Would love to tour it in person. Overall, the house is nice. I do not understand the concept of open floor plans including kitchens. This one is in full view the moment you step in the door. I don’t like viewing the mess of cooking while I am eating, especially when entertaining. How could a guest ever relax and have a restful night in the guest room with that busy wallpaper? Day to day living was not well considered in this design or decor. Too bad. It’s a nice place to visit (except for spending the night) but I would not want to live there. What a great house. It is light filled, energetic, designed with kid friendly colors and very comfortable. If I were fortunate to win I would be ready to move in. I would spend my day moving from sunporch to sunporch. Beautiful house but that guest room wall paper….couldn’t sleep for all the LOUDness! Did anyone else notice on the outside of the house that only ONE window had shutters? Made the house look “off” somehow! I would love to win it but we all know the chances are slim to none!! I was waiting for someone to bring up the shutters – but actually there are shutters on TWO windows – and it looks totally off to me. That was the very first thing I noticed. The rest of it – meh…I agree with most of the other posters. oh fooey… I just accidentally unsubscribed from all your emails. Is there any way to get them back again? I resubscribed to this thread but now it’s the only one I’ve got. Hi! I love your website and emails and this is the first time I have ever commented on one. I think this house is lovely. I like the dark colors and the use of tile and wallpaper. I would love this house, but would simplify it if it were mine. But I have another question for you. I’ve always been more than a little skeptical when it comes to HGTV giveaways. When we enter we give our name, email, address and phone. It’s a good amount of information, but how do they do the ambush style winner announcements? How do they get the job locations, neighbor info, and all of that I wonder. Have you ever heard anything about it? In any case, thanks for all you do and keep up the good work! Hi Angela! Good question about how they track people down to give them the news. I haven’t heard any stories about that, but if anyone else knows how they pull off the ambush-style announcements, fill us in! I LURV THIS HOUSE!!! The only issue I find is that I cannot enter due to being a Canadian. We’d move to Raleigh with our family (even with the humidity in summer) but sadly cannot. I’ll settle for taking some inspiration from the kitchen. It’s the only room that doesn’t closely resemble our own style, for the moment. As kitchen remodels should always have a healthy budget we’ve put it off for a short while. Overall, just way too much going on in this house. I like calmer decor; not all white or gray and white, but more soothing colors. Too many patterns also. The bones of the house look nice, however. My 5 cents for what it’s worth …. I do like some of the decor, but not all of it and definitely not all in the same space/house. To me it comes off as loud and gaudy overall. Almost like a bunch of (very different) designers got together and shoved their favorite things in the house, or someone is just trying way too hard. There’s no flow. It’s very jolting to the eye. Do you know what color paint is used on body , trim, and. Door? I love the floor plan and home but some of the decorating I’m not crazy about. But I would definitely love to win. What is the property address? We are currently visiting Raleigh and would love to see the house for ourselves. Thank you! Ugh… sensory overload! It is just way too busy for me. I could never relax in that house. Simplicity is elegance and this concept was lost on the designers. In their defense, perhaps they were required to use everything the sponsors gave them. I do like the pretty stair railing though! Holy cow. The choices made for the interior design of this home are SO BAD that I had to take time to find a way to post my opinion. The gaudy colors, the hideous patterns, the horrific combinations of the gaudy colors and hideous patterns… a beautiful home destroyed by terrible decisions. Agree 100%! I would feel uncomfortable just going for a visit. I was so excited to hear that this house was in NC because it is somewhere that i’ve been looking to live, however after viewing the pictures and seeing the layout I think I would take the 750,000 cash option instead of this home which they claim cost 1.2 million. I’ve been looking at homes in thing area on Zillow for sometime now and homes this size cost around 400,000 in Raleigh. I understand that it comes furnished and has all the fancy electronic features but I personally am not a big fan of the decor other than the kitchen and don’t think the electronic features are something I would waste my money on. I just dont think this home would actually sell for 1.2 million! Agreed. This house caps out at maybe 500k, and I’m being generous based on the smart features. They always overprice them which just makes the taxes go up for the winner. I wonder if any winner could get a home appraisal and if hgtv would even allow that. They always such expensive furniture too. One of the living room chairs cost over $1,200. I have no idea how much the other chair, sofa, tables, lamps and assorted doodads cost but I’m sure it’s a pretty penny. The 2 accent chairs in the dining room are $1,259 each and the table is almost $3,ooo. and that doesn’t include the 4 wooden chairs. One of the fabric headboards is $2,000… and that’s only a few of the furnishings. It all adds up. I wasn’t factoring in the furniture at 500k. But so much of it is objectionable! Maybe they’d let you pull out most of the furniture so you could deduct that from the prize cost. Me and my husband would love to win it. He would be close to his children he hasn’t seen in 19 yrs and our kids could get to meet them for the 1st time. We have never owned a house before always rented due to our credit. The kids would love this house is love the house it’s already in the style I like wouldn’t have to change a thing ( maybe the nursery no babies only our 16 and 6 yr old kids). I enter everyday and hope we win it’s like it was made for us the style and location is perfect for us. Far too much REALLY over-the-top decor. I can’t say there was much here I liked, and I’d have nightmares if I had to sleep in that guest room! Does anyone know where the other door of the nursery leads? On the floor plan it looks like it is above the garage and has a lot of space but no info. There is also a similar space off of the second floor laundry room. Anyone have any details on either of these? This would be ideal for me and my husband. He is a recent amputee and the first floor master is what we need. Also, plenty of room for our grandchildren who are 2 and 5 months. Our church is located in Raleigh. This would be perfect. I hope I win. Thanks. Why do I feel like I’d need to duck my head in this house? I’m only five feet tall. Its too dark, even with all those windows. The lighting fixtures, bath fixtures, furnishings, accessories and art work are all very “ethnic” looking. I wonder why. The only universal, seemingly neutral room is the master bedroom closet, in my opinion. Go figure its the only room I like. I couldn’t live in this house as is. Nor could I visit and stay long. Its sadly uncomfortable feeling to me.